Pour sherry over crabmeat to marinate; set aside. Melt butter, add onions and green peppers; cook until transparent. Add flour and blend, gradually add milk and seasonings. Cook over low heat, stirring constantly, until thickened. Add egg yolk and cook 2 minutes. 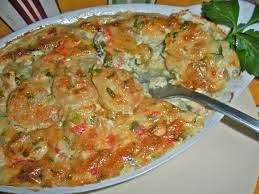 Remove from heat; add soft crumbs, crabmeat and parsley. Gently mix and pour into well-greased 1 1/2 quart casserole. Top with buttered crumbs and sprinkle with paprika. Bake at 400 degrees for 20 to 25 minutes. Serves 6.